Treasures from the Heart made an apron from an old bed dust ruffle. 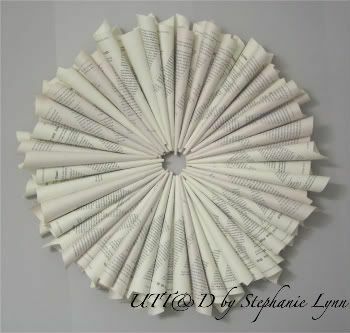 Stephanie Lynn made this beautiful book page wreath. Lucky Star Lane made these cute mugs for her dad. Sit Relax and Read posted a tutorial on how to make this cute snowman shirt. I have seen these banners all over the blog world and must make one this year. Lynette's LAM Blog made this cute New Year one. Domestically Speaking seems to always be doing something great with paint. After Christmas always comes big Clearances and I went out and got a few good deals along with millions of others. I passed by many great bargains without even being tempted and only got a couple of items that I needed or really loved. Something that would have been hard for me to do a few years ago. 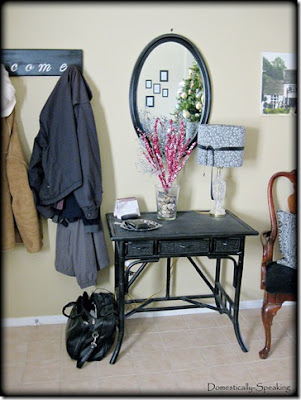 I LOVE thrifty little blog because she lives by the same rules and even posted them for us. I promise that if you read her post before going shopping and follow her rules, you will never have buyers remorse again. Thanks Kasey! 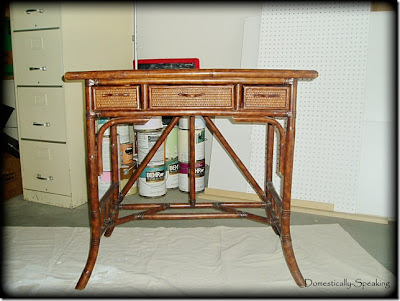 I just love the "after" photo of this chair by Flea Market Trixie. It looks like it belongs in a fancy catalogue. *You have until 10:00 am MST Tuesday to get your link up. Thank you so much for the feature and link - I greatly appreciate it! So happy to be joining again this week! Hope you are enjoying the New Year. Thanks for hosting! Great high lights Jen! I'm bummed I can't link up this week, but my project for this week was new Pottery Barn curtains...not exactly thrifty! But I'll be back next week! Sometimes spending more money and buying something you absolutely LOVE is more thrifty. If it makes you happy and brightens up your day whenever you look at it, it was worth the money. Especially since you will be less likely to buy new ones for a long time. Enjoy your curtains and I'll see you next week. I think I'm addicted to this party! Back to link again :). Good job not giving in to the sales!